Welcome to the Town of Springfield! 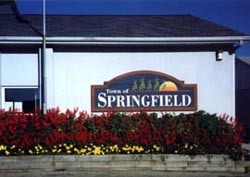 The Town of Springfield, located in northwestern Dane County, Wisconsin is predominately a farming community. The town is about six miles square bordering both sides of U.S.Hwy. 12. A population of approximately 2,900 enjoy the rural atmosphere, with its gently rolling topography. We are served by three different school districts, four post offices, three EMS departments and two fire departments. We encourage Springfield residents and visitors to explore our website. We welcome your suggestions for information you would like us to include here, or your ideas on how we can make the site more useful to you. Thank you for visiting us on the web! Please take notice that the Annual Town Meeting for the Town of Springfield, Dane County, Wisconsin, for the purpose of transacting such business as may be necessary and allowed by law will be held at town hall, 6157 County Highway P, Dane, WI, on the third Tuesday of April (April 16, 2019) at 7:00 p.m. The Town of Springfield’s Email List provides periodic updates to town citizens on town news, meetings and other issues of interest. Citizens may self-subscribe to the list by visiting the subscription page. Occasionally meetings or errands may alter these times; you are encouraged to call ahead before visiting the office. We gladly welcome after hour appointments; please call the office at (608) 849-7887 to make arrangements. Copyright © 2001- Town of Springfield. All Rights Reserved.